1. Pour the juice through a mesh strainer set over a medium mixing bowl. Check for pulp and strain again if necessary. 2. Add the simple syrup, mix well, and refrigerate for 4–6 hours to ripen the mixture. 3. Remove from the refrigerator and add the chilled champagne. It’s important that all ingredients be very cold. 4. Process the grapefruit-champagne mixture in an ice cream maker according to the manufacturer’s instructions. 5. 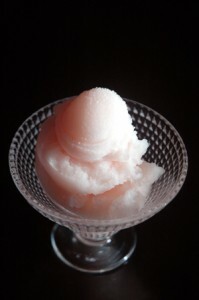 Spoon the finished sorbet into a container, cover it, and place in the freezer for 4–6 hours or overnight to harden. 6. Remove from the freezer 10 minutes before serving. 15 minutes plus 9–12 hours downtime. If you can squeeze an orange, you can prepare this elegant, colorful dessert. Dress it up with a sprig of mint and a splash of Cointreau if you like.